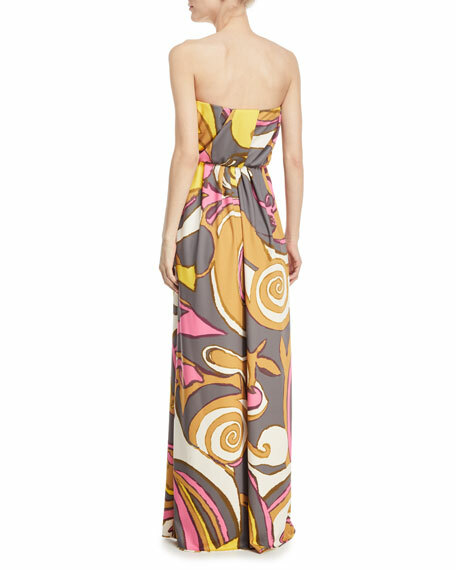 Marc Jacobs abstract-print jersey gown. For in-store inquiries, use sku #2461905. Rock the lines in this geometric-striped MARC by Marc Jacobs dress. Ink/blue arrowhead-print jersey with ruffle trim. Crew neckline. Sleeveless; full shoulder coverage. Elastic waistband. Straight skirt; rounded hem hits above knee. Lyocell. Imported. 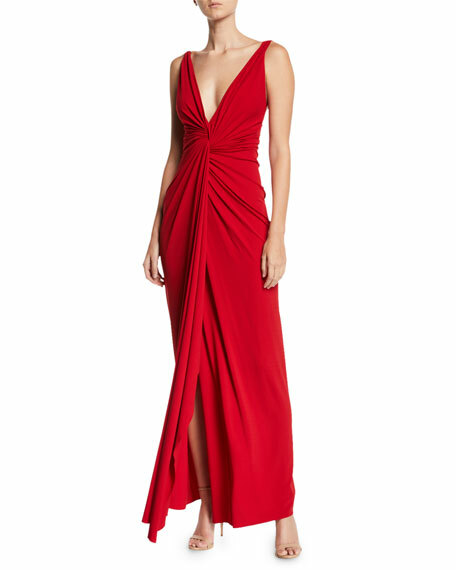 Alexandre Vauthier gown in jersey. Deep V neckline. Thin shoulder straps. Twisted front. Column silhouette. Wrapped skirt. Maxi length. Back zip. Viscose/spandex. Made in Romania. Model's measurements: Height 5'11"/180cm, bust 32"/81cm, waist 25"/64cm, hips 36"/91cm, dress size US 2/4. Exclusively ours. 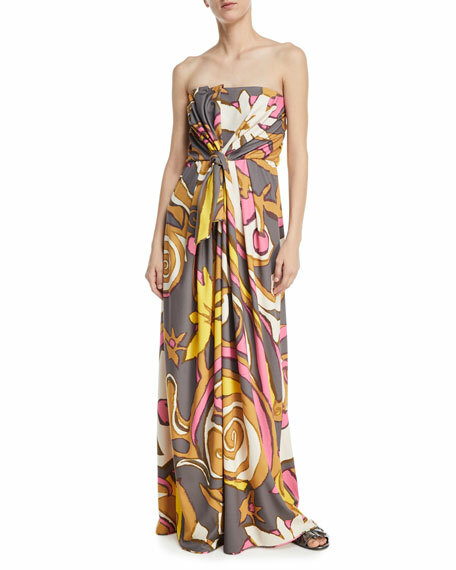 J. Mendel gown in silk georgette. V neckline. Short sleeves. Twisted front with shimmered bead embroidery. Column silhouette. Floor length. Silk; combo, cotton/silk. Made in USA of imported material. 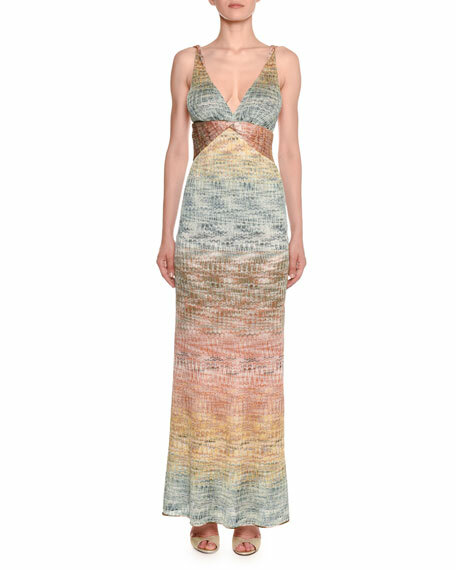 Missoni metallic-degrade knit dress. Deep V neckline. Twisted front. Sleeveless; thin straps. Slim silhouette. 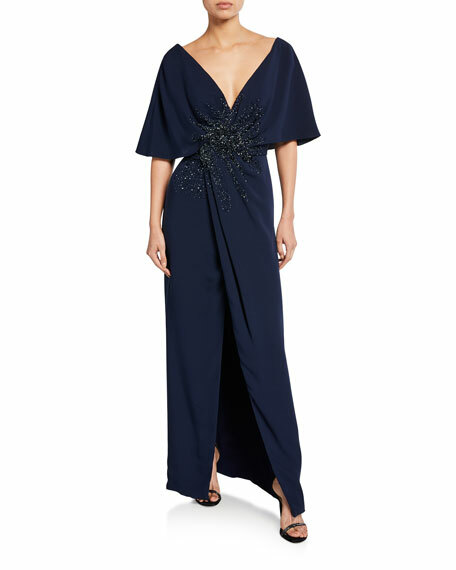 Floor-length. Rayon/cupro/polyester. Lining, silk/spandex. Made in Italy.